Pipe leaks have a lot of negative effects, like water damage and constant puddles or indoor flooding. All of these scenarios can cost you a lot of money when it comes to repairs and cleaning bills, not to mention cause you and your family a huge inconvenience. Even a small pipe leak can cause various problems like a mold infestation or reduced water pressure. But more importantly, a pipe leak, no matter how small, can lead to wastage of both a precious natural resource and your hard-earned money. Meanwhile, broken or burst pipes are a lot more stressful to deal with if only because the damage is a little more instantaneous. Your furniture can be flooded and stained, your electrical appliances can be broken beyond repair, and worst of all, your walls, floors, and ceilings can suffer from considerable damage. Leak fixes and pipe repairs are things that are best left to the capable hands of your local plumber. Some DIY solutions might prove to be effective for some time, but this will only delay the inevitable problems that will arise. If you call on your local plumber at the first sign of trouble, you’ll minimize the consequences and your home life will be back to normal in no time. Calling your local house plumber to deal with leak fixes and pipe repairs also ensures that the solution they will apply will last for longer, giving you more bang for your buck. Couple this with the lower and more accurate prices they offer compared to plumbers from out of town, and you truly get the most value out of your money. Hiring a local plumber also means that they can do a quicker and better job. They don’t have to travel far and they won’t have a hard time navigating the roads, so they can get to your location that much faster. This is especially important if you have an emergency at hand and need the burst pipes to be dealt with immediately. And because they are familiar with the plumbing structures, geography, and weather conditions, the solutions they apply will certainly be better suited for your home. 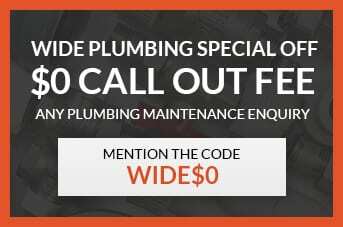 For leak fixes and pipe repairs in the Central Coast suburb, give Wide Plumbing Services a call at 0419 012 750 or send an email to centralwideservices@gmail.com. We will be more than happy to answer your enquiries and offer you a no-obligations estimate. Our friendly customer service personnel are standing by, and our team of highly skilled plumbers are always at the ready to fix any issue with your plumbing. Your local plumber can charge you either a fixed rate or a per-hour rate. Fixed rates vary a lot between companies, while per-hour rates can range from $75 to $225. The final cost is dependent on the amount of work to be done, as well as the price of the replacement materials that were used. However, you can ask your local plumber if the cost of the parts can already be included in a packaged rate. Calling your local plumber immediately when you see the first signs of a leak or damage to your pipes can net you huge savings. When you leave leaky pipes unattended for a long period, you will also likely need the services of a cleaning crew and a construction company. The fixes that your local plumber will also last for a long time, so you won’t need to call them as often to deal with your plumbing problems that you fixed with a DIY solution. We here at Wide Plumbing Services are experts at leak fixes and pipe repairs. Our team of licensed and highly skilled plumbers will ensure that the fixes and repairs will last and your plumbing will stay in good shape for a long time. Just give us a call so that we can look over your plumbing systems, give you an honest assessment and a no-obligations estimate, and recommend cost-effective solutions. Rest assured that we will always delivery top-quality professional services, no matter how big or small the task may be. Wide Plumbing Services guarantees quality, value, and cleanliness in all of our work. We especially put value in the cleanliness because we know just how much value you put on your property. Rest assured that we will work quickly to restore your plumbing in good working order, and leave your home in excellent condition. Expect us to deliver prompt and high-quality work for fair prices whenever you avail of our services.